The name Rinkosan comes from the mountain's name, representing the town of Yaotsu, in Gifu Prefecture. Rinkosan Black Vinegar has a mild taste crafted by techniques passed down generations at the Uchibori Vinegar Brewery. Noted for the natural sweetness of rice, and its appetite-stirring, rich aroma. With a soft acidity, this vinegar is easy to incorporate, even with delicately flavored dishes. Sprinkling in that gentle acidity brings out the umami in stir-fries and grilled fish. 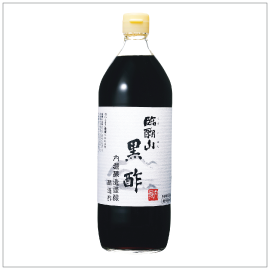 You can also mix Rinkosan Black Vinegar with 3-parts water to 1-part vinegar, adding honey to taste, to enjoy as a delicious drink.